Get creative on the go with the 2-in-1 Magnetic Art Desk from Epoch Everlasting Play. Designed for ages 3 years and older, this portable desk fits comfortably on your child's lap. Slide open magnetic 2-sided drawing board can be used flat or in the upright position, with all magnetic letters and dry erase pens storing inside. 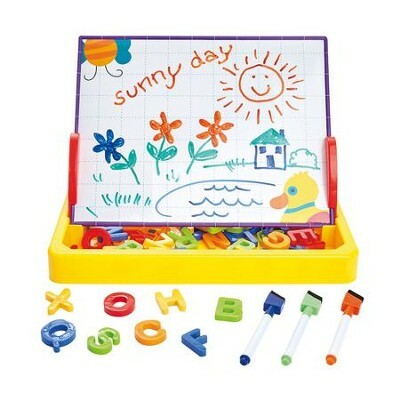 Includes double letters for the entire alphabet, and 3 dry erase markers. I'm the author/artist and I want to review 2 In 1 Magnetic Art Desk.